What is a Hybrid Surveillance Camera System? 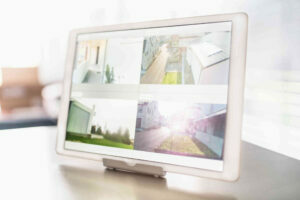 We recommend considering a hybrid surveillance camera system. Surveillance systems are essential for protecting your business, but we understand that the cost of replacing your entire security camera system might not be in your budget. For that reason, we recommend considering a hybrid surveillance camera system. Your business’s existing analog camera systems can be linked with IP cameras in a hybrid surveillance camera system setup. By not having to overhaul your entire camera system, you can save money because with a hybrid surveillance camera system, you’ll gradually transition from analog cameras to IP cameras as needed. Analog camera systems rely on digital video recorder (DVR) systems. The video that is recorded on a DVR system is stored for later viewing. Standard video compression technology is used to make the files of the recording smaller – meaning multiple videos of the same length can be stored. However, there is a limit to the number of cameras that can be connected through the DVR system. Most commonly, a DVR system can accommodate cameras grouped into sets of 4, 8, 16, or 32. This limit exists due to technical limitations – the DVR systems depend on a technology known as capture cards, and there are only so many capture cards that can be inserted into a computer. Each capture card also has a certain number of open ports to use. Although analog camera systems are generally less expensive than IP camera systems, the trade-off is that the video can only be recorded in low resolutions, resulting in low-quality images. An IP camera system is often connected through network video recorder systems, which are also known as NVR. IP cameras can record digital images rather than analog. Unlike analog camera systems, IP camera systems are less restricted by technical constraints. The size of an IP camera system is constrained only by how well the network performs and the recorder system in use. The number of cameras used in an IP camera system determines the technical specifications needed in terms of processor speed, available memory, and total storage space. The more resources available, the smoother the system will run. While analog camera systems are restricted to low-resolution cameras and image quality, IP camera systems are not. Higher resolution cameras can provide higher quality images with much more detail, and because of this improved efficiency, one high-resolution camera can perform better than three low-resolution cameras set over the same location. A hybrid surveillance camera system combines the advantages of both of these other systems discussed above. Upgrading from analog camera systems to IP camera systems is easier because of the overall lower cost. IP camera systems can be deployed in more sensitive areas, while standard analog camera systems can be deployed in areas that are less sensitive. The key component is known as the hybrid DVR – a DVR system that can accommodate both analog and IP camera systems, maximizing the potential of these systems. This entry was posted on Tuesday, July 18th, 2017 at 12:59 pm. Both comments and pings are currently closed.